Last year, we renovated our bathroom due to some mould issues. I would like to tell you that we planned ahead and did up a budget for the project, that we thought about what needed to be done ahead of time, but we didn’t. What started as a bathroom project and a small renovation of our bedroom turned into two bathrooms (we discovered mould in the adjoining wall when we demoed the original bathroom), more in our bedroom than we had planned, the kitchen ceiling (caused by a leak when something happened to one of the bathroom pipes during the renovations), the homeschool room ceiling (to accommodate for a drain above), and a paint job through most of the main floor and the upstairs hallway (when we had to cut through the wall at the bottom of the stairs when the new bathtub got stuck)! I know that there are things that cannot be planned for, but had we planned ahead and at least done up a budget, we would have been much more prepared for what was to come. Our two week, one and a half room renovation ended up taking three months and affecting five rooms and the hallways and entry. It also cost us triple what we had imagined. 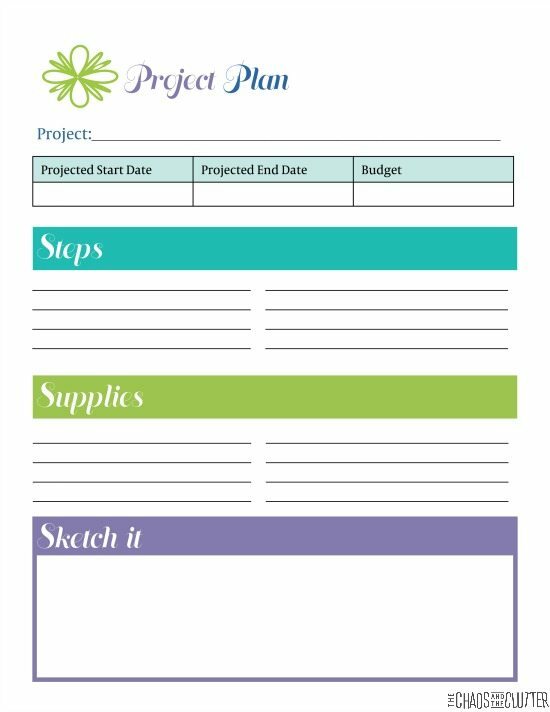 I’m hoping that this simple printable set helps other families avoid some of the disasters we encountered. Planning ahead can help you foresee potential challenges and delays. It can also help you be able to purchase supplies on sale, have what you need on hand, know how much time to allot for projects, and cut down on stress. 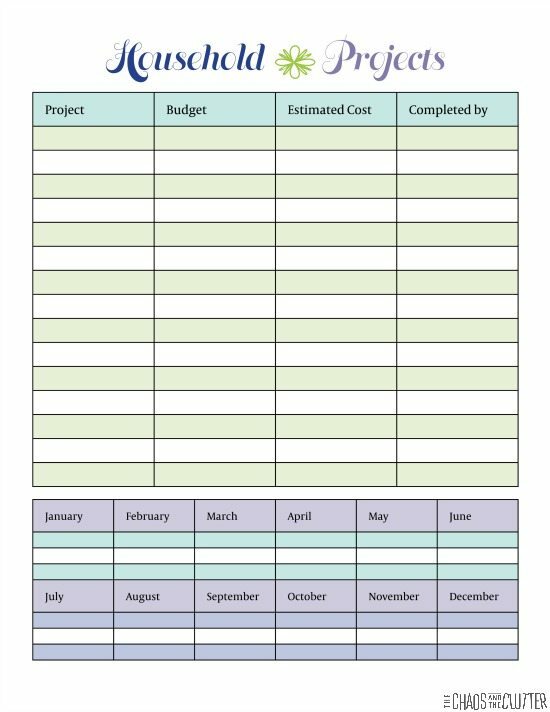 These printable worksheets can be edited so that you can type right in them and plan for every house project you have this year from the very simple (changing lightbulbs) to the more complex (building a deck, finishing a basement or renovating a kitchen). 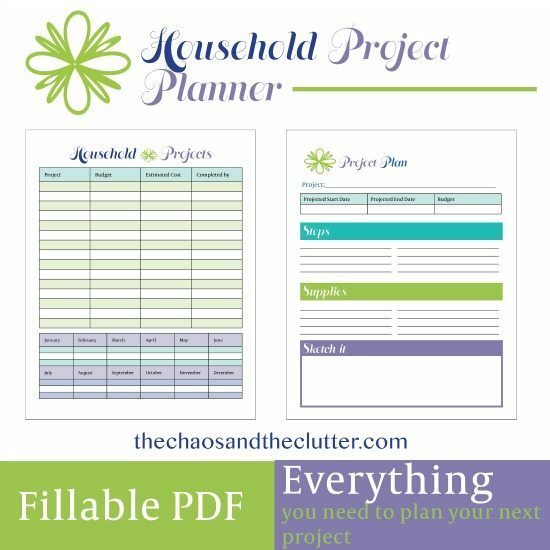 I suggest that you print one of the Household Projects sheets to create an overall plan for the entire year and then print as many of the Project Plan sheets as are needed. To download the PDFs, simply click here or on any of the images on this page. I sincerely hope this can save you some of the headache that home renovations or household projects can entail. If you’re looking for other household tips and organization ideas, you may want to follow me on Pinterest. Thanks so much for posting this! My wife are newlyweds and will be buying my Grandparent’s house sometime within the next few years. It was built over a hundred years ago so there are a bunch of projects we’re trying to plan for, and my wife loves having everything organized. I’m going to make a binder for her with your pages in it and I’m sure she’ll love the simple and cute format.